A visit to nearby Longwood Gardens inspired this quilled all occasion card... so many wonderful flowers on display, including some beauties that gave the illusion of growing upside down. I came home wanting to duplicate them in paper. The flower, quilled with graduated color strips, is mounted on a gilded frame sticker from Martha Stewart's line at my local Michaels store. Love them! The package comes with two sheets of several frames each, in a variety of beautiful shapes. In my stash of crafty bits, I'd been saving a gold embossed floral filigree design, stamped a few years back at a Stampin'Up workshop... perfect to use as a layering paper. 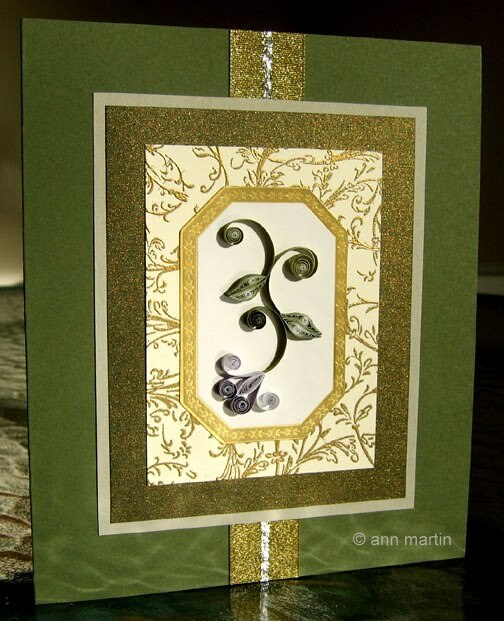 Another rectangle of antique gold paper, a layer of gray cardstock, and a strip of metallic ribbon finish it off. Yes, you've guessed it... I'm a fan of subtle metallic accents; can never get enough. 1. Prepare khaki card blank. Cut a 6 1/2 inch x 11 inch piece of card. Score at midpoint of length (5 1/2 inch mark) and fold, creating a 5 1/2 x 6 1/2 inch card. 2. Stamp design on ivory card with Versamark. Sprinkle generously with embossing powder, tap off excess, and heat until powder has melted and raised. When cool, trim rectangle to 2 3/4 inches x 4 inches. 3. Cut gold paper ( 3 3/4 x 4 3/4 inches) and gray cardstock (4 x 5 inches) rectangles. 4. Adhere layers on card as pictured. 5. Adhere frame sticker (2 x 3 inches) to center of embossed rectangle. 6. Mark center of frame with pencil dot. 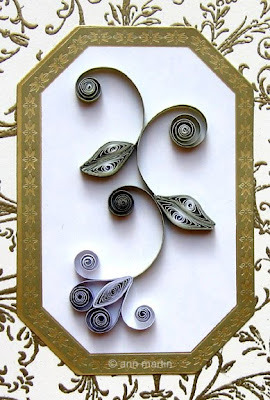 If you're new to quilling, my tutorial here has all the information you'll need to get started. Keep in mind that at first glance, quilling looks more complicated than it is. Many of the different shapes start with the very same building block... a round coil that's pinched in different ways to create a variety of shapes. To make most types, you'll slide the strip of coiled paper off the tool and glue the end, forming a circle - then pinch as shown/described below. Marquise (make 1) - Make a 4 inch loose coil and glue end; pinch opposite sides, making two points. Shaped marquise (make 4) Make a 4 inch marquise. Holding points of marquise, curve one end to the left and the other end to the right, making it resemble a leaf. V scroll (make 1) - Fold a 4 inch strip in half; roll each end outward, away from midpoint. Heart scroll (make 1) - Fold a 4 inch strip in half; roll each end inward, toward midpoint. Loose scroll (make 3) - Roll a 3 inch strip; smooth paper allowing tail to curve slightly, leaving other end coiled. 1. Make blossom: Glue the point of heart scroll inside V scroll. Glue one end of marquise inside the heart scroll. 2. Make stem: Arrange and glue three loose scrolls as pictured. 3. Make leaves: Glue two shaped marquises side-by-side for each leaf, pressing into leafy shape. Glue onto loose scroll stem. 4. Spread a shallow puddle of glue on a plastic lid. 5. Grasp the finished flower with tweezers and dip the underside gently in the glue. Position it in the center of the frame. Tip: When working with graduated color quilling strips, if you would like the color variations to be the same, as I did for the leaves with each coil having a white center, you'll need to cut paper lengths from the same portion of strips. Graduated color strips are available from most online quilling suppliers. Wow! Very beautiful card! Love the combination of colors you have used. Thanks for the tutorial. Beautiful and elegant! I know what you mean about seeing a flower and wanting to recreate it in quilling, I have a whole folder of beautiful flower pictures just waiting to be quilled! Gorgeous! I love Longwood Gardens and made a point of going there with my mom every time she came to visit me when I lived in Baltimore. Amazing! Thanks for sharing with the rest of us "newbies" such clear and concise instructions! Hi Soncie, you're welcome and happy quilling!